After two rest days in a row, my legs were really aching to go for a run this morning. It's funny, my legs always ached when I was obese, and I assumed it was from being obese--and maybe it was--but now, if I go more than two days without a run, I get that same ache. The only way to make them feel better is to run! With four miles on the schedule, and the temp at a toasty 21 this morning, I headed outside. I did my favorite out-and-back route. There were a few patches of solid ice, and it was kind of scary running on it, but most of the road was dry. It felt really good to run this morning! That's the best part about taking a couple of days off--it actually feels good to do it again. When I uploaded my run, I noticed that Garmin Connect added a new feature to their website--the weather from the time of day and location that you ran. This could vary enormously, depending on the amount of fruits and veggies eaten (I happen to eat quite a bit of fruit, which is 0 PP but I still counted the calories for it). My PP target is 32 on maintenance, and usually I don't only eat the minimum like I did Sunday and Monday, but that was right after I went out Saturday and spent a billion PP on Mexican food and margaritas. Thursday was my long run day, so naturally, I ate a lot more. 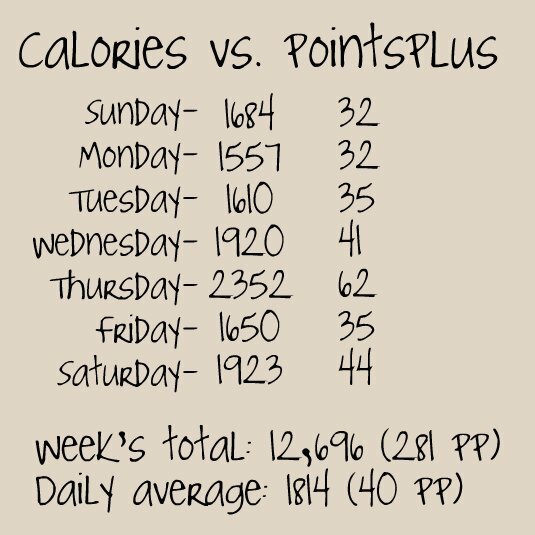 Regardless, I averaged 1814 calories per day (or 40 PP), which is probably pretty typical on maintenance (for me, anyway). Just looking at this picture makes me feel warm and cozy! I like how you aren't focused on calories. I used to be a counter, but then I noticed that I would be super (on the verge of restriction) healthy during the day, but then at night when I saw I had an extra 600 calories to eat, I would GO TO TOWN and eat way more than 600. Now that I don't, I still weigh the exact same, and restriction doesn't happen. Yay! Thank you for being such an inspiration. You are literally the person I go to (your blog that is) when I need motivation through words or pictures and you have no idea how much I appreciate your presence in the weight loss blogging community. You are pretty awesome! Even if you have a bad day or two, over the course of a week or a month, it's not that big of a deal! Just brush yourself off and keep on going. I've had to do it a thousands times over the past few years! I noticed this on Garmin yesterday, too! I really like this feature. Keep up the awesome work! You truly are an inspiration. I fell walking out the door yesterday, so I can not imagine running out there! I'm just a chicken! Oh no! Hope you're okay? Feels like 14! I don't think I'd be able to get out of bed let alone go running outside! Way to go Katie! It actually wasn't too bad yesterday! The wind makes a big difference, and it wasn't very windy. You don't use the chart in the Weight Watcher book to get your activity points? (The white book - "Pocket Guide for Lifetime Members") Do you feel that it is not accurate? This is the first time I've heard of any other way of calculating points, although I've only been to one meeting in years and that was just to get the new program materials. Do you get your calories burned from your Garmin? My Garmin gives me calories burned but my 205 doesn't have a heart rate monitor so I don't know how accurate it is. I never even noticed that there was a chart there! Hahaha, I've always just used the website or my phone app to calculate the PP, and then I eventually started dividing calories burned by 80. I just looked up a few sample runs, and the book looks like it gives the same numbers as the app and the website. My new Garmin is very accurate with the calories burned, because it takes my heart rate into consideration, which is why I used that number. I'd be interested to see what would come up if you used Active Link - do you? I have found that I was overcalculating my AP. It's been an adjustment to get used to. I haven't tried the Active Link, but a reader just asked me if I'd like hers, since she doesn't want it. So I'll post about that soon :) I'm curious what it tells me! I'm pretty inactive other that the running, so I bet my activity PP will be a lot less than I'm used to. But I've done great at maintenance while using my method, so I may just stick to what I'm doing! I've found the same thing, Tracy! It's kind of depressing to see that on a typical day of sitting at work all day, then going to 2 1 hour fitness classes each, I "only" earn 4-5 APs with the ActiveLinK! haha. Yes, Katie please report back! How awesome of your reader!